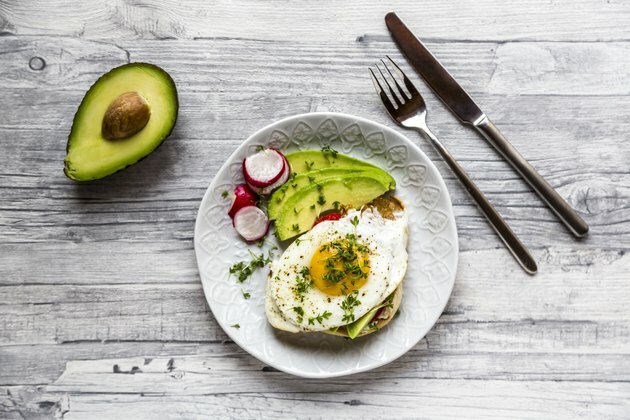 Brain foods like eggs, avocado, almonds and blueberries are not only delicious, they’re what to eat for a fit mind! What you eat today can affect your brain now and later. Whether that’s a positive or negative impact is up to what you put on your plate — or in your glass. As with overall health, foods and beverages play a role in mental fitness, including memory, focus and concentration and mind sharpness. They may have a potential preventative role in the development of dementia, Alzheimer’s disease or other neurodegenerative brain disorders too. Who Should Eat Brain Foods? Everyone can benefit from a sharp mind. “Short term, the right foods can help you perform better at school or work; the wrong foods can lead to brain fog,” says Maggie Moon, M.S., RD, author of “The MIND Diet.” Research backs it up. A breakfast study finds that a lower-glycemic morning meal may lead to better memory and attention span up to two hours later, adds Moon. Putting research deliciously into practice, Moon shares that her go-to “smart” breakfast is avocado toast with an egg on it. “Long term, a healthy diet can keep your brain running like it’s nearly a decade younger than what your driver’s license says, while a poor diet ages your mind much faster and increases the risk of developing dementia,” says Moon. She supports the evidence-based MIND diet, which is a blend of the Mediterranean and DASH diets and has been optimized for brain health. Keep in mind that your brain is fueled by carbs. So rather than cutting carbs, a wiser approach is to follow a plan with brain health-promoting foods, such as the MIND diet, which includes the “right” carbs. Even if you’re not following a specific plan, do include picks from this list of brain foods and beverages into your personal eating routine. Berries are usually listed at the top of the fruit charts for health promotion. 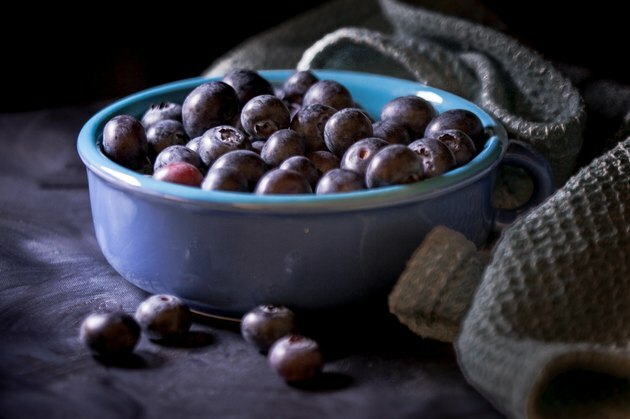 Due to their powerhouse of polyphenols, including flavonoid pigments called anthocyanins, blueberries are often number one. And they can help protect your brain: In study of more than 16,000 women, those eating blueberries at least once a week were three to four years cognitively younger, says Moon. Plus, short-term experimental studies have shown that berries boost cognition, perhaps because berries are high in flavonoids, which have a winning combination of antioxidant and anti-inflammatory characteristics. The MIND diet suggests eating berries twice a week. 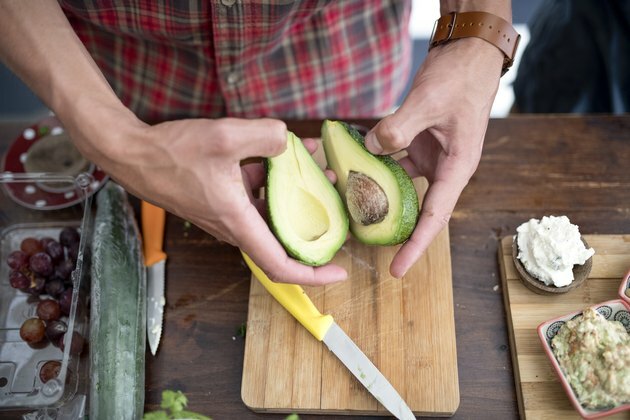 “Avocados score triple points for brain health,” says Cynthia Sass, RD, CSSD, a New York- and Los Angeles-based performance nutritionist. The monounsaturated fat and antioxidants in avocados help to optimize circulation, which contributes to better blood flow to the brain. “Their potassium also helps regulate blood pressure, which is protective, since hypertension is a risk factor for cognitive decline,” Sass adds. Aim to eat one-third of an avocado a day, especially early on to help boost mental focus and concentration for the rest of the day. Avocado toast, anyone? The key nutritional compound in this brain food is choline. Choline is vital for optimum brain functioning and making the neurotransmitter acetylcholine, which is associated with memory. Worried about scoring your best on a test or work project? Research finds that a higher choline intake has been associated with fewer errors in a test measuring cognitive ability. 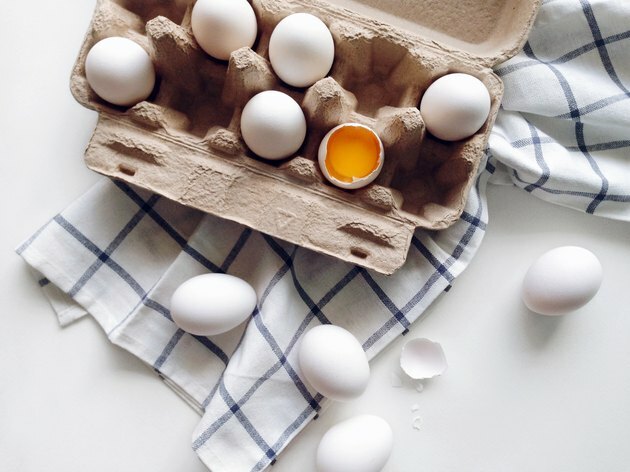 To be your brainy best, consider eating an egg a day. Maybe more. Go nuts! Snacking on almonds is tasty food for concentration. Almonds are the top nut source of vitamin E, and research finds this fat-soluble vitamin may help slow cognitive decline and boost memory and mental alertness. Plus, a study published in the Journal of the American Medical Association found that high amounts of vitamin E (2000 IU/d of alpha tocopherol) slowed the functional decline of people with mild to moderate Alzheimer’s disease. 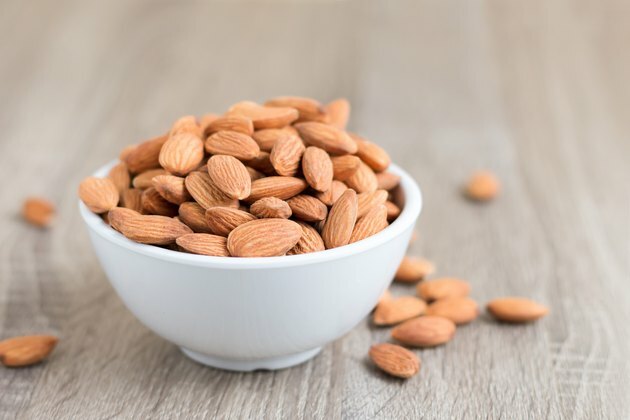 Because one ounce of almonds (that’s about 23) provides 35 percent of the vitamin E you need daily, consider enjoying at least a dozen almonds daily. 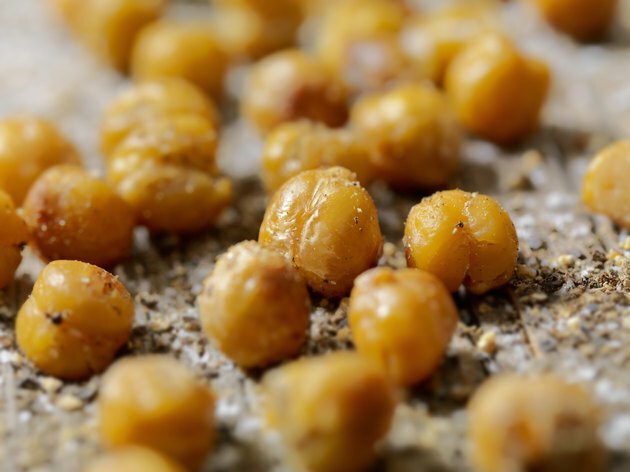 A standout nutrient in garbanzo beans (aka chickpeas) is vitamin B-6.aspx). Not getting enough of it may contribute to poor concentration short term and cognitive decline long term. All other beans have brain benefits too. “Beans are a low-glycemic food with slow-digesting carbohydrates for even blood sugar levels, which is good for short-term concentration,” says Moon. “A study of more than 2,000 Swedish older adults ages 60 years and older showed that healthy diets that include beans provide neuroprotection — and the same trend was found in a study of Taiwanese adults aged 65 years and up,” adds Moon. The MIND diet suggests eating beans every other day. Yes, hummus counts! “Beets are chock-full of natural brain boosters,” says Sass. She adds that nitrates in beets help open up blood vessels and increase blood flow to the brain, particularly to the frontal lobes. Those are the areas of the brain “most commonly associated with degeneration, which can lead to cognitive problems, including dementia.” What’s more, in research presented at the 255th National Meeting & Exposition of the American Chemical Society, betanin, a compound in beets, was found to help slow reactions occurring in the brain linked to Alzheimer’s disease. 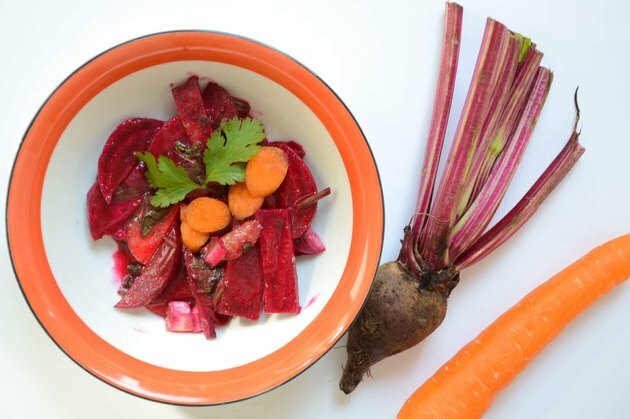 Consider eating a serving of beets a couple of times a week. 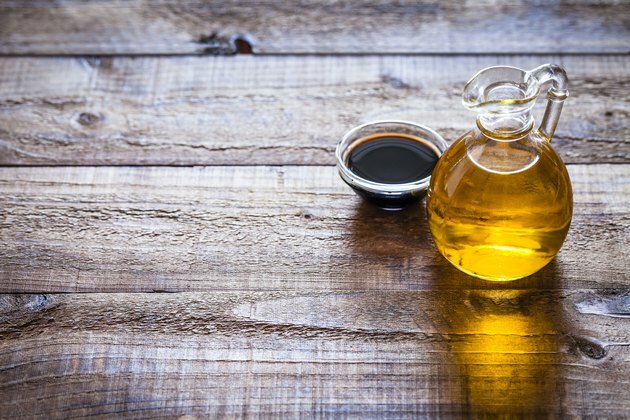 Best known as a heart-healthful pick, extra-virgin olive oil is a brain food too. “Olive oil has approximately 230 antioxidants and polyphenols, but oleocanthal may be especially neuroprotective,” says Moon. She points to an animal study where oleocanthal was found to boost production of proteins and enzymes that are essential to clearing beta-amyloid from the brain, which is important because buildup of beta-amyloid plaques eventually disrupts nerve cell function. “In a sub-study of the larger PREDIMED trial, people eating diets supplemented with olive oil had better immediate and delayed forms of verbal memory,” adds Moon. Drizzle a little olive oil onto dishes often. 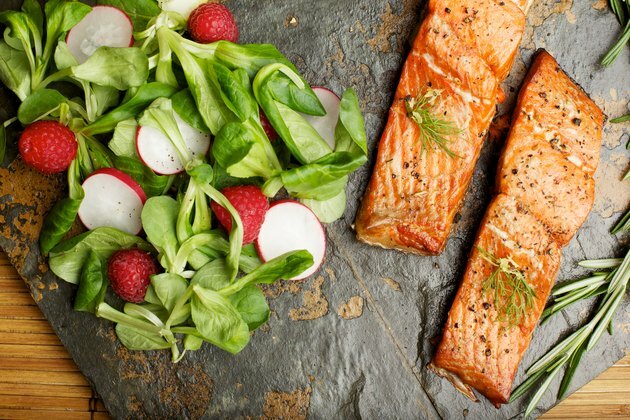 Salmon isn’t just a brain food, it’s a brain superfood thanks to its omega-3s. A study published in Nutrients finds that having a healthful balance of omega-3s in the diet is associated with anti-inflammatory benefits and may help prevent or slow the progression of neurological disorders. Plus, salmon contains astaxanthin, a marine antioxidant carotenoid that may slow memory loss. Enjoy a serving of wild salmon a couple of times weekly for neuroprotective benefits. Or be sure to get omega-3-rich plant foods, such as chia seeds, walnuts and pecans. Kale yes! 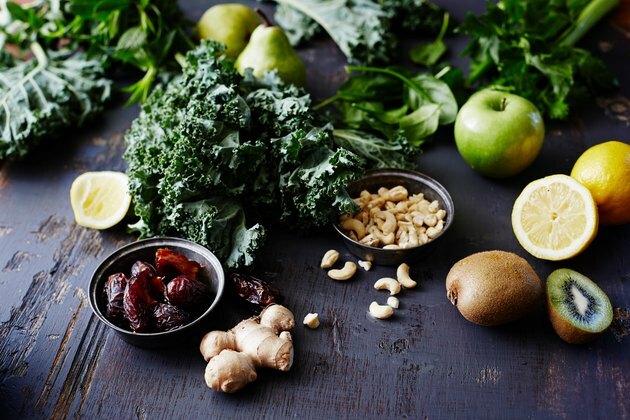 “Dark leafy greens like kale may help put a fork in cognitive decline,” says Sass. She adds that recent research shows eating just one serving a day of leafy green veggies may help preserve memory and thinking skills as a person grows older — and can potentially lead to having brains that cognitively perform a whopping 11 years younger! “That’s a huge potential benefit for one simple change, and a food that also offers bonus protection against both heart disease and cancer,” says Sass. Eat them often! Cheers to brain health. 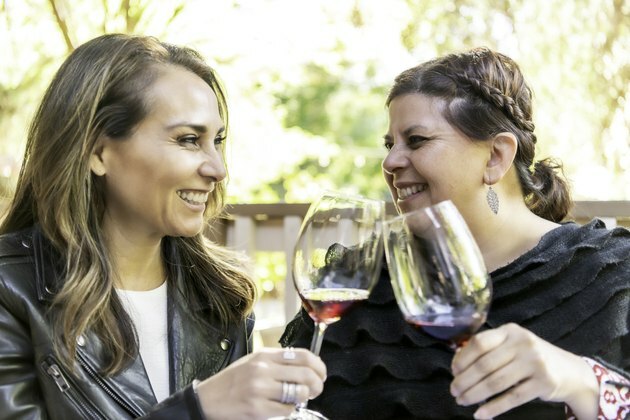 “A glass of wine a day, and no more (sorry), is a polyphenol-rich beverage linked to better cognitive function, based on observational and clinical studies,” says Moon. While it’s unclear how it works, the benefits may be related to the antioxidant and anti-inflammatory compounds in red wine, she adds. However, one important polyphenol in red wine is resveratrol. Research finds that resveratrol may have a beneficial impact on memory performance. The MIND diet suggests having one five-ounce glass of wine a day. Pomegranate is a brain food. 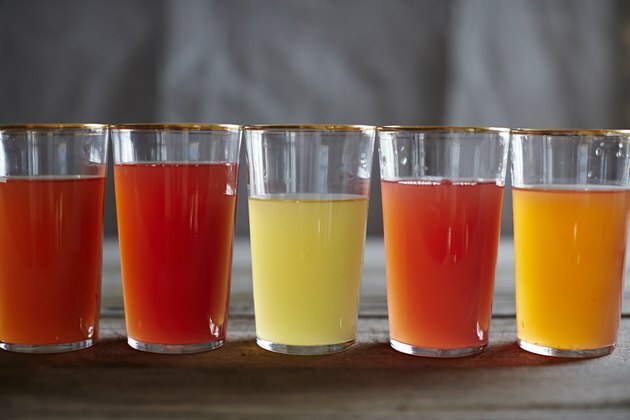 Its juice is a potent source of antioxidants — even more so than red wine! Drinking it may offer benefits to brain health in as few as four weeks. 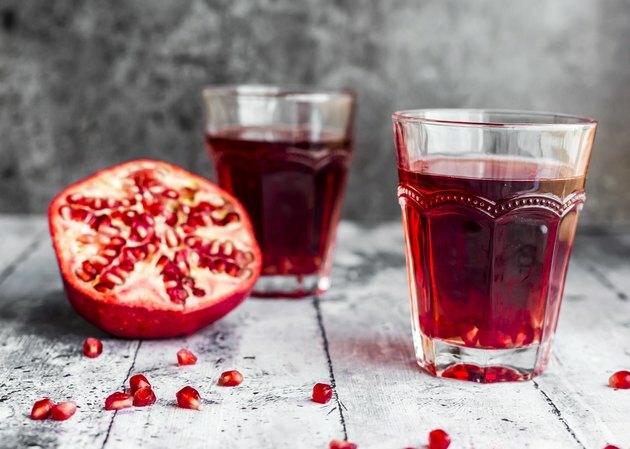 A UCLA study in older adults with mild age-related memory complaints found that having eight ounces of 100 percent pomegranate juice a day improved verbal memory and increased functional brain activity during visual and verbal memory tasks. If you drink juice, pick pomegranate. Yerba mate is a tea-like beverage that is Argentina’s national drink. It’s made from the leaves of the yerba mate tree. It’s loaded with polyphenols and may offer more health benefits than green tea. What about your brain? If you need to concentrate, sipping on yerba mate may help, due largely to its caffeine. One cup of yerba mate contains 78 milligrams of caffeine, which is just slightly less than your typical cup of coffee. A review of research finds that caffeine may help boost attention span, problem solving, reaction time and more in sleep-deprived people. Enjoy yerba mate just as you do coffee or tea. Have you had your kombucha today? It might help you concentrate. There’s a connection between gut health and brain health. In other words, the healthier your gut, the better your brain. Scientifically speaking, gut microbes can produce neurotransmitters that are found in your brain. One of the best ways to improve gut health is to get probiotics, such as those found in kefir, kombucha or other probiotic beverages. Ultimately, these beverages and other probiotic-rich foods may play a role in boosting alertness, mental sharpness and overall cognition. Sip one regularly. Sorry, doughnuts and deep-fried anything aren’t brain foods. Basically, if a food isn’t good for overall health, it’s likely not good for your brain either. “Fried foods, cheese, red meat, pastries, baked goods, sweets and butter should be limited,” says Moon. Notice that she didn’t say “eliminated!” How often is it OK to enjoy these foods? “Eat most of these foods no more than once a week, and less if it’s possible to do so without making yourself crazy,” she adds. There’s science behind this advice. “Limiting these foods was part of the diet that led to better cognitive aging and reduced the risk of Alzheimer’s disease in the MIND studies,” says Moon. In a nutshell, the MIND researchers note that these are all foods that increase the intake of saturated and trans fats in proportion to unsaturated fats, leading to blood-brain barrier problems and increased beta-amyloid plaque, she notes. No, you can’t follow a poor diet and hope your daily kombucha will keep your brain in tip-top shape. A healthful overall eating plan is vitally important. The Mediterranean diet, Nordic diet and wholesome plant-based diets in general are all solid approaches for boosting brain health. And the MIND diet may be the brain-friendliest eating plan of them all. Remember that even if you don’t feel the effects for decades afterward, cognitive decline starts as early as your 30s. “I know it’s hard to eat today for health outcomes that are decades off, but that’s what we should all be doing” says Moon.